2013 Weekday cabin reservation discount special. Call 800-461-1023. FREE lift ticket. Yes, we are giving away cash during this Weekday snow special: you pay for 2 available cabin lodging nights and get cash for a FREE tift ticket at Bear Mountain, Snow Summit or Snow Valley... or cash for an hour of your boat rental at Pleasure Point Marina. Call us today for these vacation details. If you have difficulty making a reservation online, call us and you still get the lowest rate. You must ask for this special offer when making your lodging reservation with us. Best family vacations in Southern California are Golden Bear Cottages Resort. Best Family Cabins, California, 2009-2014 rated the best place to stay in Big Bear Lake. News: http://bigbearlakemarketingassociation.com/latinos_ahorra_en_espanol "cabañas aprobado de AAA"
The Big Bear Lake Marketing Association through it's local and regional partnerships is responsible for the development and daily management of 13 websites consisting of lodging, accommodations, resort cabins, boat rentals, family friendly vacations, news and reviews. We daily update over 30 news stories about Big Bear events, discounts and weather. We manage over 2370 web landing pages of discount coupons and vacation planning. The sites have over 1350 current photos and 150 links of the drive to the mountains, the four seasons, resort cabin interiors and exteriors, boat rentals and events of local interest for both families and groups. We are sponsors of the Big Bear Lake Latino Hotel Association, somos bilingual y hablamos espanol. 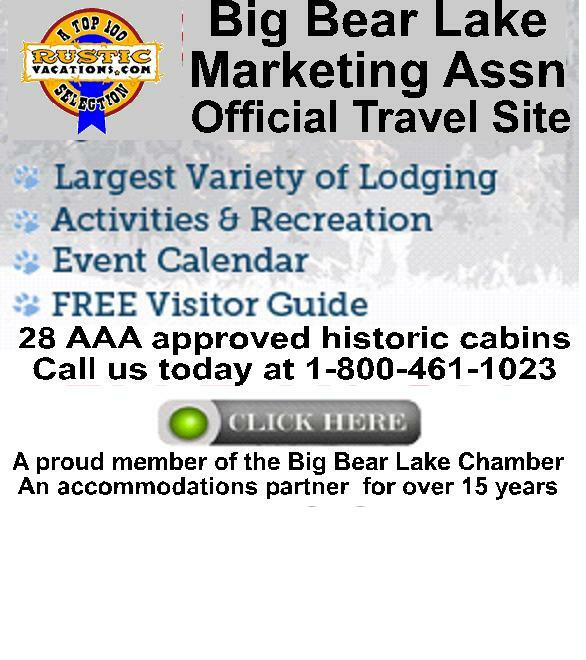 Golden Bear Cottages is a founding member in excellent standing with the Big Bear Lake Marketing Association (BBLMA). Big Bear Lake's best places to stay: "AAA approved cabins"
BBB has determined that Golden Bear Cottages meets all BBB accreditation standards, which include a commitment to make a good faith effort to resolve any consumer complaints. BBB Accredited Businesses pay a fee for accreditation and review/monitoring and for support of BBB services to the public on a regular basis. Better Business Bureau A+ rating assigned to this resort cabin lodging business is determined by our composite score of such factors as the type of business, length of time in business and superior level of lodging compliance for all groups and retreats. and national pet organizations such as AVMA, Pet Friendly Travel and Animal Care Wellness Center. Inland Empire and reaching into Orange and Los Angeles Counties. VirtualChapel.com, WorldWideFishing.com, Yahoo, YahooTravel.com and YouTube. Big Bear Lake, CA. Official AAA approved lodging reservations in Spanish and English. Big Bear para la semana o fin de semana perfecto itinerario.